Chinese President Xi Jinping arrived in Spain on November 27 for a three-day state visit to consolidate traditional friendship and strengthen cooperation between the two countries. It is the first visit by a Chinese head of state to the European nation in 13 years. Two Spanish fighter jets escorted Xi's plane as it entered the country's airspace. 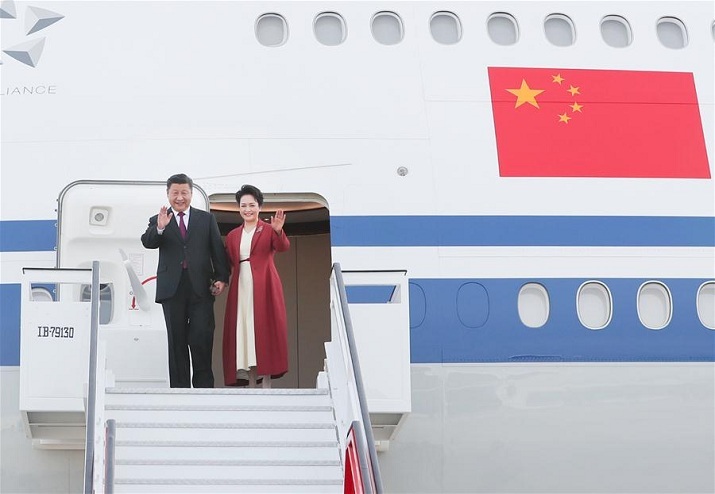 Xi and his wife, Peng Liyuan, were greeted by senior Spanish officials at the airport. They were also presented with flowers by Spanish children. Upon arrival, Xi said China and Spain have a long history of exchanges thanks to the ancient overland and maritime Silk Road trade routes. The two countries established a comprehensive strategic partnership in 2005, ushering in a new phase in the development of bilateral relations, Xi added. Noting that now China and Spain are both at an important stage for reform and development, Xi said it is not only in the interest of both countries and peoples but also conducive to world peace, stability and prosperity for the two sides to deepen bilateral ties, cement traditional friendship, expand practical cooperation and achieve common development. He said he looks forward to having extensive and in-depth exchanges of views with King Felipe VI, Prime Minister Pedro Sanchez and other leaders of Spain on bilateral relations and issues of common concern, so as to kick-start a new journey for the China-Spain comprehensive strategic partnership. The visit also comes as the two countries mark the 45th anniversary of their diplomatic relations this year. Spain is the first stop of Xi's ongoing Europe and Latin America tour, which will also take him to Argentina, Panama and Portugal. In Buenos Aires, Argentina, Xi will also attend the 13th Group of 20 summit.